C. H. Schlichting Kornahrens died on this date 96 years ago. She was born at Bremervorde, Hannover, Germany 19 January 1849. 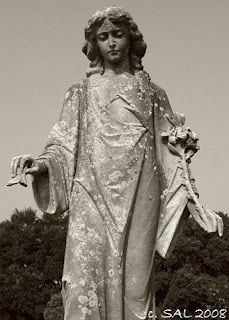 She died at Summerville, South Carolina and was buried in Bethany Cemetery; Charleston, South Carolina. The photo is of the angel on her tombstone. H. Coburn Chancey died on this date 20 years ago. Coburn was born 10 December 1912 and was buried in Sardis Cemetery; Bibb County, Georgia.